The touring exhibition and the catalogue are likewise the result of a collective effort of rather different people. The fact that we came together has got little to do with the art of designing posters in the first place. Certainly the choice of the exhibited posters was accompanied by heated arguments on formal aspects as well. But these arguments, in favour of or against certain creative proposals, always lead to discussions of political aspects. 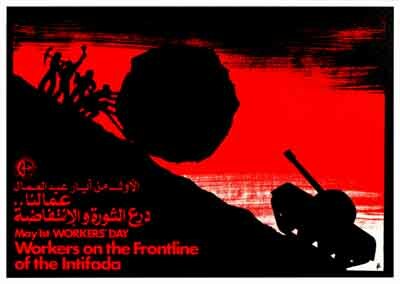 In the forefront stood solidarity on an international level. 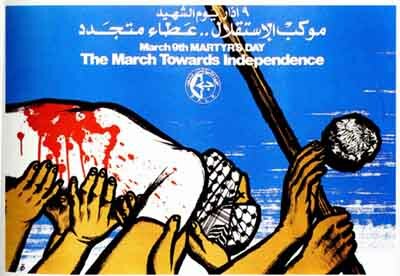 Jihad Mansour has been creating political graphic art which was mostly published by the Popular Front for the Liberation of Palestine PFLP. His work tells of many bitter stages of the struggle for liberation and for the return of innumerable refugees to their country. 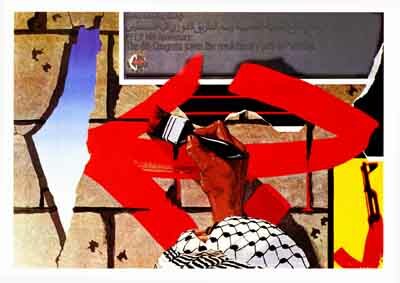 He designed posters which should be understood by the people living in the occupied territories in Israel, as well as by those living in the refugee camps in Syria, Jordan and Lebanon. They should be understood by all those who often knew their homeland only through the stories told by their grandparents. 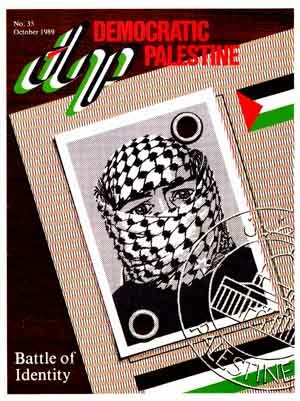 At the same time the posters should help to strengthen the will to continue to fight for liberation. But the images created should also be understood by the solidarity movements in countries abroad, so they could use them for their particular work. Since the fall of one of the super powers and the proclamation of a «new» imperialistic world order by the other one the situation for the struggles for liberation in the periphery (Trikont) has become extremely difficult. In spite of all these unpleasantnesses they are carried on even if they are increasingly screened from Western headlines and the minds of the Western Left as well. Once a proud swan internationalism appears to be more likely a plucked chicken nowadays. Many comrades who were supporters once have begun to sneak away from our i.e. their common history. But not so Jihad Mansour. A fact that leads us straight to the question of actual solidarity. 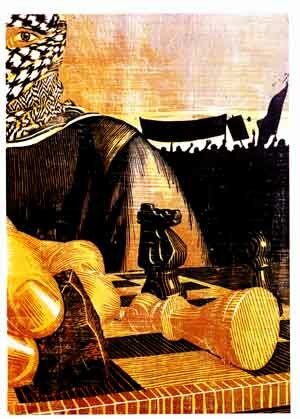 Marc Rudin, aka Jihad Mansour, is part of our own history. Together with many among us he set out at the end of the sixties with love an joy and with the radical claim to bring together thinking and acting. The task of course has been to overthrow capitalism. But our hopes of the time have run aground first of all and what remains is a stock of experiences which is worth not being forgotten. In 1979 Marc Rudin hardly managed to escape from Swiss police to live in exile henceforth. The separation happened abruptly and was a painful experience. But for him it was at the same time the beginning of a very productive period of his life. He was a political refugee unlike many of those today whose flight takes them from the periphery to the centres. He was warmly welcomed by a people whose consciousness was formed by the bitter experience of exile. He was not forced to hide his face nor had he to deny his story and become silent. He even managed to take roots. But he was uprooted again at the end of 1991. Exposed to the glaring spotlights of Turkish police, a bundle of his belongings beside him on the floor: we were startled by the news and the picture of his arrest. We would have hardly recognized him in the street - but he still seemed to be the same. His presence in our minds demands at least now, as he is deprived of the ability to act, that we come to terms with ourselves and with our history. 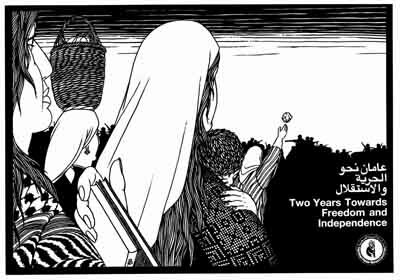 We've got to ask ourselves the harassing question how we could reactivate internationalistic solidarity as an opposing force to the threatening national egoism of today and how we could live simple practical solidarity with political prisoners. This means solidarity as well with Marc Rudin who has been handed over to Denmark where he shall be tried for having allegedly not restricted himself to fight with pen and brush. Hopefully the following pages might bring about some of the discussions that the life of resistance of Marc Rudin, aka Jihad Mansour, has set loose. We are glad that he himself was able to help with the concept of the exhibition and with the choice of the posters through correspondence.